Guest rooms are available April 1st until the middle of December. The Franciscan Guest House hotel is an affordable and comfortable hotel on the Kennebunk River only a 10 minutes walk to the village center and a 15 minute walk to the beach. Rooms offer private bath, mini-fridge, free WiFi, and A/C. A continental breakfast is included with your stay with a small fee for the full breakfast. During peak season, the outdoor saltwater pool is a quiet oasis away from the bustling town center. 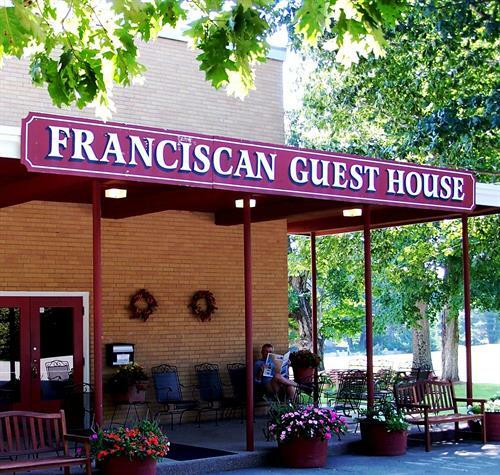 The hotel was converted from the Franciscan Friar run boarding school and now provide guest rooms to families, seniors, young couples, and groups. The hotel is a unique property for those looking for something a little different. Located on 44 acres of St. Anthony's Monastery, some rooms have beautiful views of the grounds designed by Frederick Law Olmsted Brothers. Simple and clean, the Franciscan Guest House offers tranquility and relaxation from spring until the middle of December. From Dock Square, head southwest on ME-9 W toward Harbour Lane, turn left onto Beach Ave. The hotel will be about a quarter mile on the left.